Article Originally Published on the Ward Village Website. Photos by Tommy Shih. Groovy-meets-aloha décor designer Kaypee Soh greets me with familiarity and graciousness as I enter his showroom in Ward Village, despite having never met me before. 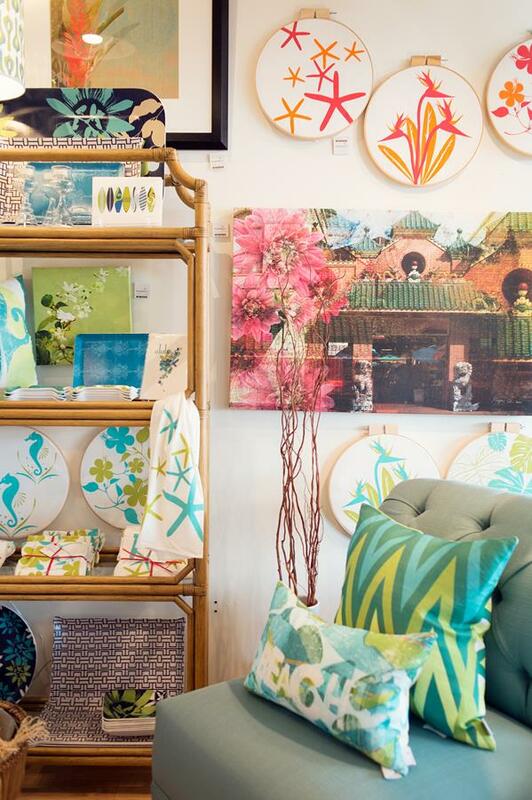 It is a warm and humbling welcome into his vibrant world—surrounding us are the keiki of his creative mind; tropical colors and prints adorn every crevasse of the store, from pillowcases to wall adornments. The branches of the hibiscus transcend outward from showroom decor to textiles. The bookshelves are not home to their usual suspects—in their places are candles and teeny ocean trinkets that beckon to be touched. “The thing about creativity is that you can do anything that you want, as long as you know how,” says Kaypee. He disengages me from the nautical enchantments of his showroom and beckons me upstairs for a peek at his most recent creations, a collection of womenswear pieces that he defines as “modern Pacific” (a fusion of island fashion and modern design), which he will be debuting at Honolulu Fashion Week in the first week of November. The graphics are breathtaking. Tropical sun-kissed colors mix with Japanese origami textiles to form a silhouette reminiscent of flower-child-inspired fashions. Red leather trim and dainty gold buckles are the staples that tie the collection together. The only thing these flirty cape and mini-skirt triplets require is a pixie cut and some knee-high boots. Kaypee remains down to earth about his design process. For him, inspiration is nature. Coming from New York, Kaypee fell in love with Hawaii. It reminded him of home in Malaysia. He loved the nature, the ocean, the sky. With him, he brought an arsenal of contacts from his graphic design days working with Tom Ford and Stella McCartney in New York and Paris. Every Monday, Kaypee checks in with his friends around the world. As pictures from Paris and London Fashion weeks filtered through his inbox, Kaypee recognized that all of the models were dressed like airline attendants from the 1960s. When the team behind Honolulu Fashion Week contacted him about an exclusive opportunity to design his own collection, he already had a muse in mind. November 6th, the first day of Honolulu Fashion Week, marks the debut of Kaypee’s Modern Pacific collection, when models will boogie down the runway in it at the opening-day, invite-only runway show. It will be on view alongside other Hawaii fashions through November 9th at the Hawaii Convention Center. Then, in spring 2015, it will be available for purchase at his showroom and in select stores! Plus, Kaypee is already plugging away on Modern Pacific caftan dresses, mens shirts, and select accessories to add to the mix. To shop some of his other creations for fashion week, visit the Honolulu Fashion Week Pop-Up Boutique, where he will have an exclusive selection of textile-designed scarves and clutches adorned with pineapple zippers available, brand new keiki he has added to the family. Friends near and far are eagerly anticipating the launch of his new creative expression, and island fashionistas are going to be just as esctatic that he decided to add his designs to the exciting mix of Hawaii fashion today.